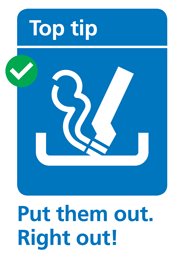 It only takes one carelessly discarded cigarette to start a fatal fire in your home. Careless disposal of cigarettes, cigars, matches and lighters are the single biggest killer in house fires across Oxfordshire and the country. If you are a smoker it is essential that you understand how dangerous smoking at home can be. This helps other family members avoid passive smoking. Tap your ash into an ashtray. Never a wastebasket and don't let the ash or cigarette ends build up in the ashtray. Purchase your e-cigarette from a reputable source. Never leave it unattended when it’s on charge. Don’t overcharge. Remove the battery from charge when it’s complete. Check your battery has overcharge or overheat protection. If the battery is damaged or has been dropped or struck don’t charge it. Don't use your e-cigarette if it is wet. Don’t overtighten the atomiser when connecting it to the charger. Fit a smoke alarm and test it weekly. Working smoke alarms could buy you valuable time to get out, stay out and call 999. Make an escape plan. Sit down and make an escape plan with family members so that everyone knows what to do if there is a fire at home.